2014 marks a new low in the continual slump in number of flags displayed by peasants to celebrate national day. It is not just ordinary peasants staying in pigeonhole housing who are bochup(heck care), even most of those high incomes staying in landed property in this land scarce island aren't displaying flags. Record low for high income peasants in landed property displaying flags as they are under increased crime risk due to the hybrid regime's grow gdp at all costs like cancer approach. Looks like too many crime as is printed on laminated white paper. 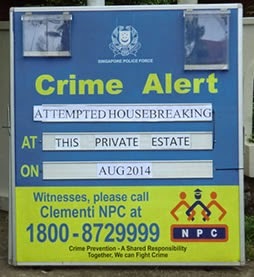 They ran out of plastic alphabet letterings for this crime alert at Faber area. Celebrity distribute free food at a peasant housing estate in bid to avert crime. As usual, if the block faces a main road, is a 2 or 3 room flat allowing for easy hanging via corridors by regime supporters, is near a train station or houses a grassroot office of the hybrid regime, it is highly likely to be plastered with flags. However, the general sentiment is abysmal as this photo taken today on national day shows. Although it is in Clementi, the same utterly bochup(heck care) is the same throughout this tiny island nation. A mix of 3,4 & 5 room flats. Is on national day. How many flags can you see? My observations are that the bigger the size of public dwelling, the less highly it is to hang flags. 5 room flats are the least likely followed by 4 room. The ratio is higher in 3 room flats & more so in 2 room flats. Higher income people generally are better educated thus they are less likely to be tempted by the hybrid regime's upgrading programs for their dwellings. 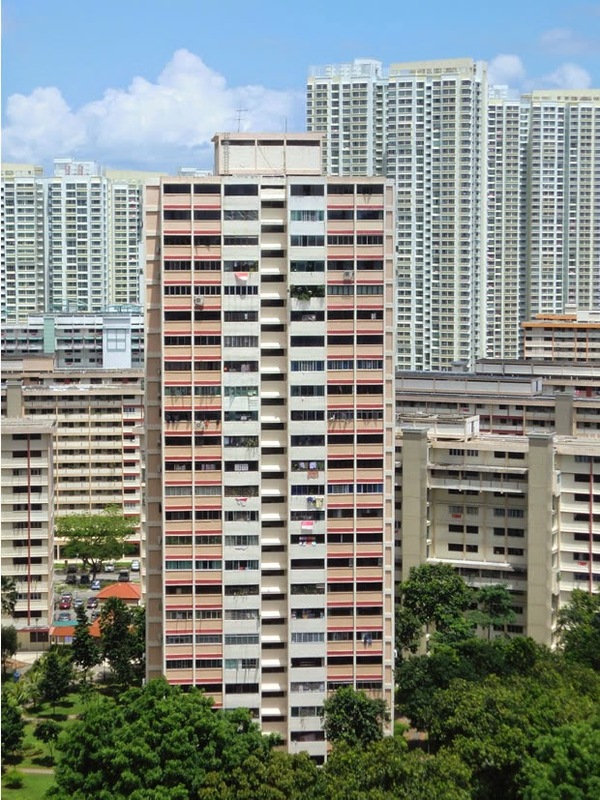 For my area, i see the lowest approval for upgrading in 5 room flats followed by 4 room flats. It is 3 room flats with highest approval. Naturally when someone is hard-up, even breadcrumbs are delicious. Over the years, all these increasingly bochup(heck care) attitude by the peasants to display flags for national day is an excellent advertisement to foreign countries about the longevity of the hybrid regime.